Brits to Force £2 Wind Power Outfits to Hold £Millions in Reserve to Pay Damages …. 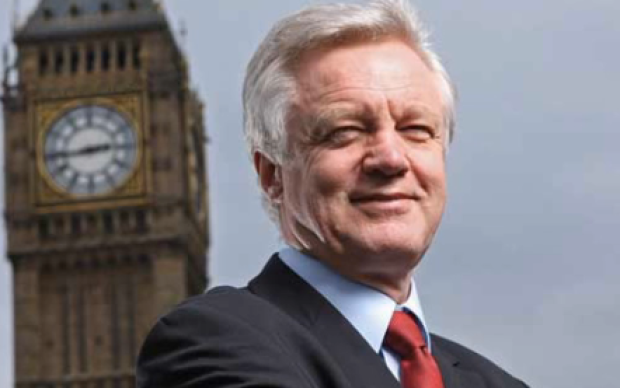 David Davis MP: pulls a common sense move for Brits’ property rights. In a stunningly brilliant legislative move, David Davis MP recently introduced a Bill in UK’s Parliament which will allow Britons to enforce judgments against wind power outfits; and which will ensure the removal of these things when they grind to an inevitable halt within the next decade or so – whether because the massive subsidies they run on are chopped; or because they have flamed out; rusted out; thrown their blades to the four winds; or have simply collapsed in heaps. The standard corporate structures used by wind power outfits involve a parent company – like Infigen, say – usually as a holding company, with a subsidiary, which usually takes on the name of the wind farm (threatened or realised), such as Cherry Tree Wind Farm Pty Ltd (a wholly owned subsidiary of Infigen – going nowhere, thanks to its inability to obtain a Power Purchase Agreement). The subsidiary is lumbered with all the current debts and other liabilities, which are loaded up in such a way as to exceed its assets (as long as the wind farm is operating, the parent sees that sufficient cash flushes through the subsidiary for it to remain technically solvent, at least in the short term). In the event that a creditor pursues the subsidiary for any substantial claim, the parent (or related holding company) simply sits back and watches its subsidiary wind up in insolvency; leaving the creditor(s) without so much as a penny to pinch. Infigen has done it all before, back when it was called “Babcock and Brown”. Among the class of creditors seeking to recover, are wind farm neighbours who successfully sue the windfarm operator (ie the subsidiary company) and who obtain a substantial award of damages for nuisance. In David Davis’s speech below, he refers to the case of Julian and Jane Davis who successfully obtained a £2 million out of court settlement from a wind farm operator, for noise nuisance; and the resultant loss of property value (the home became uninhabitable due to low-frequency noise, infrasound and vibration). So, the next time you’ve got some wind industry parasite mouthing off that there has never been a successful claim against a wind power outfit, simply flick them a link to this post. The other reason for setting up £2 subsidiary companies (in Australia referred to as $2 companies) of little or no real value, is to avoid (by winding up in insolvency) liability to clean up the mess after the rort is all over and done with. Rust Never Sleeps: monuments to stupidity grace Hawaii’s verdant hills. While planning authorities often talk about obtaining what are called “decommissioning bonds”, whatever promises are made, are given by the subsidiary (not the parent), which is designed to have no assets available to cover the cost of decommissioning; whenever that inevitable event takes place. 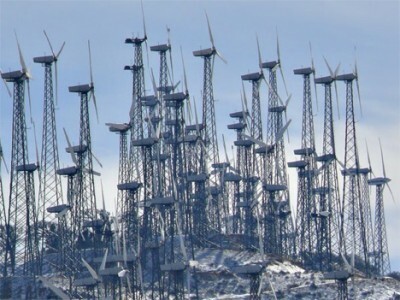 Hence, the thousands of wind turbines scattered all over California and Hawaii, left rusting as monuments to our political betters’ collective stupidity (see our post here). To avoid that event, David Davis introduced the “Public Nuisance from Wind Farms (Mandatory Liability Cover) Bill”, which is to be voted on sometime next month. Here’s David’s speech as he introduces the Bill – video and then audio (Hansard – Transcript follows). 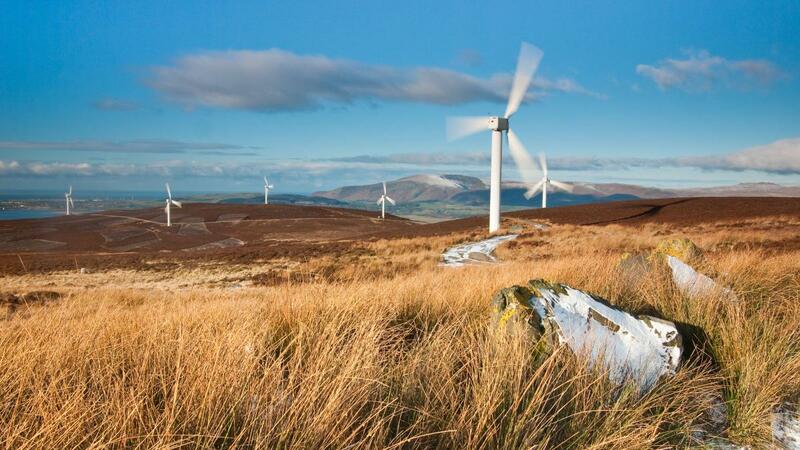 That leave be given to bring a Bill to require the Secretary of State to make provision about obligations on wind farm operators in respect of financial cover for potential liabilities arising from cause of public nuisance; and for connected purposes. Wind farms are contentious. Some argue passionately that they are a great public good and the solution to global warming while others equally passionately believe they are a waste of money. This Bill takes no side in that debate. It is narrowly defined to one aspect of public interest; it requires the operators of wind farms, who are in receipt of £797 million of public subsidy a year, to organise their affairs so that they are able to meet the costs of any nuisance imposed on people living near them. In 1995 the World Health Organisation recommended that to prevent sleep interruption low frequency noise should not exceed 30 decibels. However, in 1996 the Government’s Energy Technology Support Unit—ETSU—set the noise limit for wind turbines at 43 decibels. That is an enormous difference; on the logarithmic decibel scale it is approximately double the WHO limit. We still use those standards today. In the last five years no planning application was refused on noise-related grounds, but there have been 600 noise-related incidents arising from wind farm operations. The majority of complaints arise as a result of amplitude modulation, which is the loud, continuous thumping or swishing noise regularly described by those living near wind farms. Numerous studies have identified that sleep is disturbed on a regular basis even at distances over 1 km away from turbines, yet under the ETSU standards turbines can be installed just 600 metres away from residential property. The wind farm companies are acutely aware of this, and all the more so since a member of the public, Jane Davis, sued a wind farm near her home for noise nuisance. The matter was settled out of court, and there is a gagging order preventing us from knowing the details, but the settlement is rumoured to have been in the region of £2 million. Since this case, some dubious measures have been taken by the industry to obstruct perfectly legitimate claims for nuisance. The use of shell companies in the wind industry seems to be the commonest trick. The parent company provides a loan to a specially created subsidiary to set up the wind farm, then leaves it in control of operations. The subsidiary’s balance sheet typically comprises the wind farm physical assets, but they are more than offset by a very large loan from the parent company, with a resulting net liability. Profits from energy generation and large amounts of public subsidy are siphoned off to the parent company. The subsidiary is left as a financial shell, with very few liquid assets and total liabilities greater than total assets. That makes it impossible to bring litigation against a wind farm, simply because there is nothing to win from them. As such companies have negative net assets, even liquidating them would generate no cash to pay either damages or a legal bill. One of my constituents bought his house in my constituency to enjoy a quiet retirement with his wife. After living there for more than a decade a 10-turbine wind farm was built near the house. The closest windmill is just over 600 metres from his home. He was assured at the planning stage that the wind farm would not trouble him, yet he has suffered the misery of regular noise and turbine blade flicker which has rendered his home almost unliveable. The low frequency noise from the turbines easily penetrates the double glazing. The couple have had to change bedrooms in order to sleep, but even so the persistent noise from the wind farm has taken its toll on his wife’s health; she now suffers heart palpitations and is prescribed anti-depressants on a permanent basis by her doctor. My constituent, fearing his retirement has been ruined and his home thoroughly devalued, attempted to use his legal insurance to claim for nuisance from the wind farm operators. While there was a good chance of success in court, the company’s finances were organised so that there was no realistic prospect of recovering either damages or the legal costs of bringing the case. That being so, his insurers would, quite understandably, not cover his legal costs. That is despite the fact that the eventual owner of the wind farm is AES, a multibillion dollar international company involved partly in renewables but largely in coal and gas, that paid its chief executive $8.4 million last year. It laughably claims in its annual report to be a “World’s Most Ethical Company”. It is not alone in its hypocrisy. In March I raised this disreputable practice with Falck Renewables, prospective operators of a wind farm near my own village in my constituency. I asked it whether it was going to do the same. It did not reply. 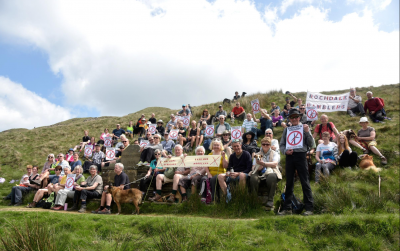 My constituents have no way to recover the tranquillity of the lives that they thought they were going to enjoy when they first moved to rural Yorkshire. They can neither sell their house nor get any financial recompense to enable them to afford to move, so they are trapped in this misery. My point is a simple one. My constituents are just individual representatives of a situation that is repeated up and down the country. Wind farm companies must be adequately capitalised so that there can be a reasonable prospect of financial success for prospective litigants whose way of life they have damaged. It is not only the noise that is a nuisance, of course. When the sun is low in the sky behind a turbine it creates a “strobe effect” which can be harmful to health and wellbeing, and there are also now concerns that some wind farms could be abandoned at the end of their operational lifespan, creating another sort of visual blight, this time in perpetuity. The simple solution that I propose in this Bill is to require wind farm-operating companies to hold enough cash in hand to manage a legal case at any time, and in addition a financial bond—a guarantee, or insurance policy—as a security against potential liabilities, including all public nuisance and final decommissioning costs. Any wind farm that fails to do that should lose its right to subsidy—which, as I said, amounted to £797 million in one year for the industry. This would ensure that citizens could reasonably sue when they suffer damage, but, just as importantly, it would be a strong incentive for the companies to operate wind farms in such a way as to avoid public nuisance, which is causing great distress in some cases, and would mean that when the turbines are decommissioned there is money or insurance to cover the cost of clearing the wind farm, avoiding a situation whereby the local council has to pick up the bill. Whatever our stance on onshore wind, companies in receipt of public subsidy should be required to meet their public responsibilities. This measure seeks to ensure that the big wind farm companies can truly be held liable when they are at fault and gives families the protection they deserve. I beg to move. Bill read the First time; to be read a Second time on Friday 11 September, and to be presented (Bill 62). 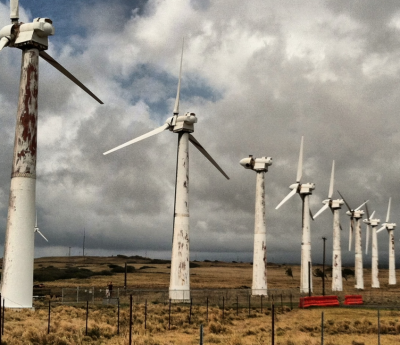 More rusting monuments to California’s ‘clean, green energy future’.